The global oleate esters market displays a highly competitive landscape due to intense rivalry between top players such as Procter & Gamble, Wilmar International Ltd., and Croda International Plc., notes a research study by Transparency Market Research. These companies are continuously striving to improve profitability by expansion of their production capacities. In addition, these companies are focused towards strategic partnerships to enhance their visibility, states the research report. 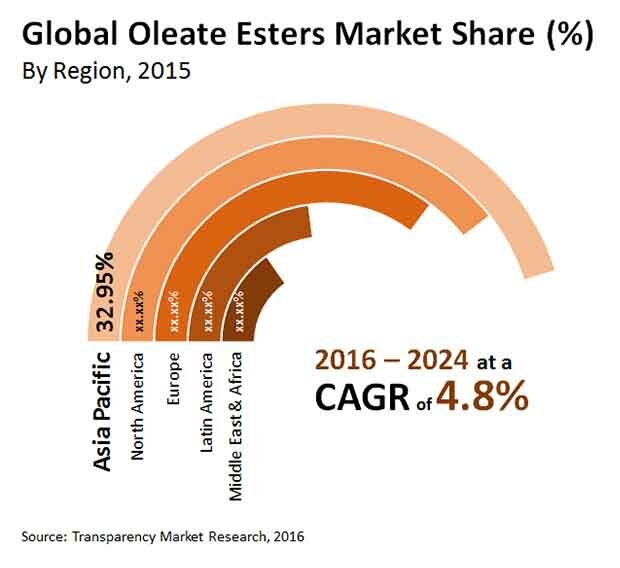 The global oleate esters market, which offered an opportunity valued at US$1.4 bn in 2015 is expected to be worth US$2.2 bn by the end of 2024 at a CAGR of 4.80% from 2016 to 2024. By volume, the global oleate esters market is expected to display a CAGR of 4.10% from 2016 to 2024. North America and Asia Pacific are major regional markets for oleate esters as these regions have a significant number of production facilities. The increasing application of oleate esters across industries is also favoring the growth of these regional markets. In North America, increasing expenditure on personal care products is expected to benefit the market’s growth. Accounting for almost 33% of the overall market, Asia Pacific stood as the leading revenue contributor to the market in 2015. This is mainly due to the easy availability of feedstock for oleate esters complemented with well-established production plants and continuous research and development undertakings. These factors will support the regional market to remain dominant until the end of the forecast period. On the other hand, the rising demand for organic esters is expected to have a positive impact on the Europe oleate esters market. In terms of product, ethyl oleate has been displaying significant demand as it is widely used in formulations of lubricants. The ethyl oleate product segment is expected to continue to hold its dominant position and expand at a CAGR of 5.10% between 2016 and 2024. Other product segments such as methyl oleate and tri-methylolpropane trioleate (TMPTO) are expected to display a declining demand in the coming years. Butyl oleate, however, is expected to display a steadfast rise in demand in future. “The top factor driving the global oleate esters market at present is the rising industrialization across the world,” says the lead author of the study. In particular, the emerging economies of Asia Pacific have surfaced as major consumers of oleate esters on account of expeditious industrialization in this region. The rising demand for a range of lubricants to be used in automobiles, industries is also expected to favor the growth of the global oleate esters market. The increasing consumption of oleate esters for agrochemicals, cosmetics, plasticizers, absorbents, and various other products is also driving the market’s growth. These products are being used for several applications due to upswing in industrialization across the world, which in turn, has fueled the consumption of oleate esters remarkably. On the flip side, high price factor of oleate esters and high cost involved in their storage and maintenance are likely to hamper their adoption in the coming years.